Seven months after its much-hyped start, Air India suspended its direct flight service from Bhubaneswar to Bangkok and from the Smart city to Bengaluru with immediate effect from Monday. The Air India had started its maiden Bhubaneswar-Bangkok flight on December 10, 2017. Chief Minister Naveen Patnaik had flagged off the first flight operation at the city airport. 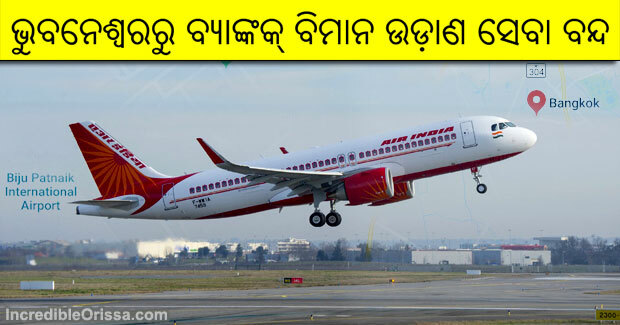 “The Air India has suspended direct flight service from Bhubaneswar to Bangkok from July 16 till September 30 due to operational reasons,” said Biju Patnaik International Airport (BPIA) Director Suresh Chandra Hota. “We have suspended the flights temporarily due to operational reasons. However, we will resume the services between Bhubaneswar and Bangkok, and Bhubaneswar-Bengaluru in a couple of months, possibly by October,” an Air India spokesperson told. The official, however, did not specify what were the reasons. Air India flight, a 162-seater Airbus 320 neo aircraft, was operating between Bhubaneswar and Bangkok every week on Thursday and Sunday. The cost for to and fro journey from Bhubaneswar to Bangkok was fixed at Rs 12,500 on a promotional basis till February 28.